What is the PAD mode on ISTA? PAD is the short form of Testing analysis diagnosis. The PAD mode is the vehicle condition between “Residing” and “Driving”.The PAD mode corresponds to the physical “terminal 15 on”. In the PAD mode, all the control units as well as all physical terminals are on. Why do you need the PAD mode? In order to switch the vehicle into diagnosis mode (Terminal 15 in the past), either for diagnosis with ISTA or programming or coding with ISTA/P, the Start/Stop button needs to be pressed 3 times in succession within .8 seconds. The vehicle will then switch over to diagnosis mode (PAD) Testing Analysis Diagnosis. In order to switch the vehicle into diagnostic mode for the State Inspection Maintenance Program, the Start/Stop button must also be pressed 3 times in succession within .8 seconds. Additionally if a diagnosis session is started with ISTA and the vehicle is in “Residing” mode, ISTA automatically switches the vehicle to diagnosis mode (PAD). – Press the START-STOP button three times within 0.8 seconds. – Via a diagnosis order. If you put in PAD mode before starting diagnosis, it should come up as PAD. ISTA shows PAD after doing this. 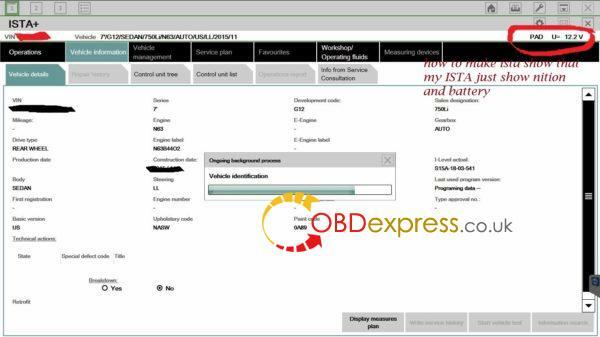 Note: During vehicle diagnosis, a vehicle with Parking-Residing-Driving is automatically placed in the pad mode.This is also displayed in ISTA in the top right.This ensures that a diagnosis can be performed with all control units. During vehicle diagnosis, a vehicle with Parking-Residing-Driving is automatically placed in the pad mode.This is also displayed in ISTA in the top right.This ensures that a diagnosis can be performed with all control units. In vehicles today, there are up to 70 control units which are networked with each other.Depending on the current vehicle condition or the user’s wishes, not all of the comfort systems and assistance systems are always required. By specifically switching off and activating the control units that aren’t required, so-called selective partial network operation, energy can be saved, the battery relieved and due to this its life increased. For vehicles with a combustion engine, the electrical energy consumption is indirectly coupled to the fuel consumption through the alternator. Here, the selective switching off of control units that are not required can contribute to the reduction of the fuel consumption and therefore the CO2 emissions. The master for the selective partial network operation is the Body Domain Controller (BDC).The control units which are not required are switched off via a corresponding bus signal. In order to realise partial network operation for control units, other transmit/receive systems are used.The transmit/receive systems are able to evaluate and interpret messages.As long there is bus communication and no valid wake-up signal for the corresponding control unit, this control unit remains switched off.If a valid wake-up signal for the corresponding control unit is sent on the bus, the transmit/receive system can activate the voltage regulator of the microcontroller and the control unit starts.The control unit is switched off by the deactivation of the voltage regulator. Note: The individual partial networks can be activated and deactivated via diagnosis orders. All partial networks are active in PAD mode. Is there problems if using ENET cable instead of ICOM in this mode?